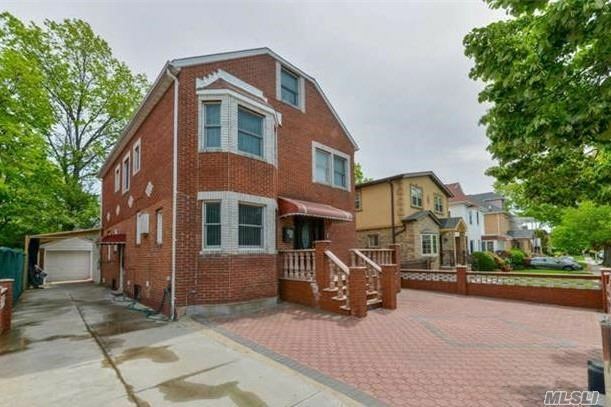 Beautifully Remodeled Colonial Detached Brick House Features 7 Bed/4.5 Bath, Fully Finished Basement W/Private Entrance, Large Finished Attic, And An Office. Heated And Cooled Detached Garage, Large Backyard, And 4 Car Driveway. Located In A Very Desirable Area Of Kew Garden Hills Within Walking Distance To Shopping, Schools, House Of Worship And Buses. This Home Has So Much To Offer, You Must See It!!! Listing information provided courtesy of Olam Realty Group. Real Estate listings held by brokerage firms other than Olam Realty Group are marked with the Broker Reciprocity logo and detailed information about them includes the name of the listing brokers. The source of the displayed data is either the property owner or public record provided by non-governmental third parties. It is believed to be reliable but not guaranteed. Information Copyright 2019, Multiple Listing Service of Long Island, Inc.